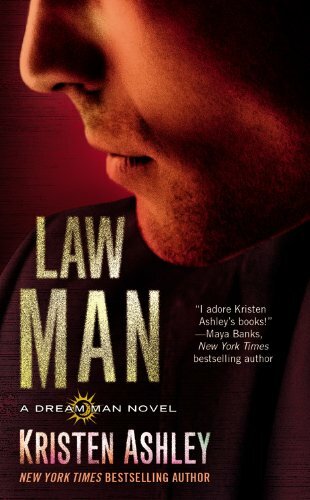 This is without a doubt my favorite book in the Dream Man Series. I have to say I just have a thing for all around really nice guys. Remember how much I loved Hank Nightingale from the Rock Chick Series? Yeah this is the same love I share for Mitch Lawson. We meet a very shy Mara in the beginning of the novel and we see how her past has made her use a judging system similar to a caste system. She thinks she is a 2.5 while her hot cop neighbor Mitch is a 10.5. She is so into this guy that she notices every detail about him. And she avoids him at all costs. Rarely if ever making even eye contact. But Mitch has noticed the beautiful Mara and now that there is an opportunity, a leaky faucet, he is going to take it. It is all rather clumsy in execution due to Mitch's past love life and Mara's shyness. But a chance, or rather unfortunate, event brings Mitch front and center in Mara's life. Now Mara has two small children to look after and a hot cop who is determined to keep the connection with her that he felt from their first official encounter. Even if he has to take on her mom, aunt, cousin and head of the Russian mob to do it! Mitch is an all around great guy. He is the kind of man that women dream of. Good looking, great cop, and a family man. When you are little and you dream about who you are going to marry, this is the guy that pops in your head. Mara has been criticized by a lot of reviewers because of her insecurities. I can tell you first hand that the reason I liked her so much was because I could relate to her. I loved that! I loved watching her grow from someone who was afraid of their own shadow to someone who flourished under love and protection. I give Law Man 4.75 lipsticks!